I've made this bag before, it is my go to pattern. You can sew it quickly and it has all the right dimensions. Today I am going to mix it up a bit and add some fun details. Tape the pattern together. This pattern does not take a lot of pages. I would suggest making a bag according to the written directions first. It helps to understand where we can move things, and how the pattern works. And then you will have an extra bag--and who doesn't need one of those? For this bag I treated it more like a purse and made one of the layers a liner. it can still be reversed--but isn't quite the same. Cut the liner out per instructions. 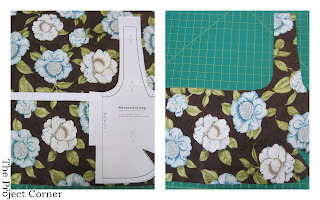 I added a little to the width, move the pattern away from the fold 2-3 inches if you want a wider purse. For pockets I cut swatches of the fabric using the selvage as one of the edges. After you sew the darts, sew on the pockets. I zig-zagged the three edges of the pockets and didn't worry about the top edge because it was the selvage edge. For the outer layer I wanted enough material to make a lot of little pleats. I moved the pattern to the outer edge of the material used a scarp piece of paper to make sure I cute the bottom and top edges straight. Once I cut out one side and used the piece of material for my pattern so that both sides would be the same size. Move every other pin to the pin it is next to--move towards or away from center. Move the next pins--you make get poked a few times. For the pleats I pinned every one inch starting from the fold in the middle of the fabric. This took a while, but is essential.From the middle skip to the second pin and make a fold by moving it to the first pin. Go to every other pin and make folds and pin. There will be a lot of pins in a small amount of space. 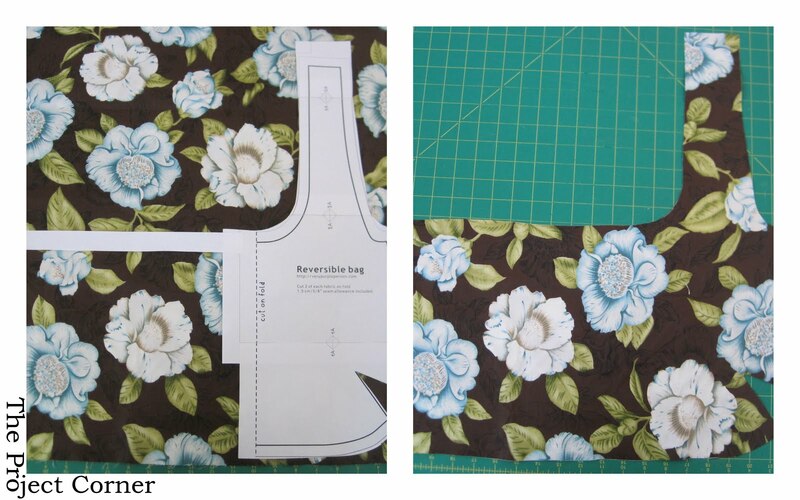 Once you have it all pinned make sure that it is the same width as the liner. You can move some of the pleats or add a few more. This isn't an exact science. Once you have all the pleats in place baste stitch both sides of the outer layer top edge. From this point on you can continue according to the instructions. Turning the purse right side out will be a little challenging. The striped fabric is a thick drapery fabric and was hard to maneuver. But once you get to a certain point it will all turn out easily. With pockets for diaper, cell phone & mom essentials. Close up of the pleats. I measured one of my monkey's diapers and made sure it would be able to fit in this pocket. Add some accessories and it is ready for a night out on the town. The flower pattern can be found here. Found you on BCD. This purse is adorable! I really love the fabric you chose and the flower! Thanks for sharing! Oh I love it! I am so excited to try this. Thank you so much for sharing your pattern! This is so cute. I love the attention to detail (pleats and pockets) and, of course, the great fabric. Cute bag! Thanks for sharing. What a cute bag. Thanks for sharing the pattern and details! This is being added to my project list! I love it! and I even have that exact fabric!